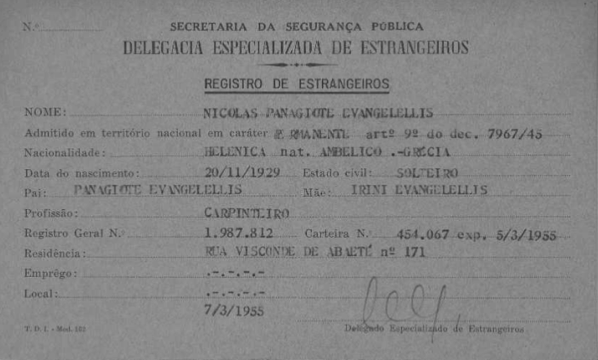 FamilySearch.org has a FREE database titled BRAZIL, SAO PAULO, IMMIGRATION CARDS, 1902-1980. There are 1,597 people who are listed as being born in Greece. This collection contains immigration cards issued by Brazilian consulates around the world. These cards were then presented at the port of entry by foreigners visiting or immigrating to Brazil through the port of Santos in São Paulo from 1902-1980. These records are housed at the Arquivo Público do Estado de São Paulo. The records are in Portuguese.